In bowl take onion paste (1sp), ginger-garlic paste (1sp), red chilly paste (1sp), turmeric (1/2sp) apply to the cleaned fish pieces (250g) on both sides. Keep it for 30min. Heat coconut oil (3sp) in pan; add curry leaves (1sp), onion paste (1 cup) fry for 2-3min and add tamarind paste (1/2 cup). Into this add the marinated fish pieces. Cook for 10-15min on medium flame. 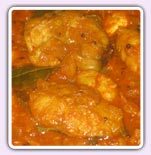 Transfer the fish curry into a serving plate and sprinkle coriander leaves and lemon juice.